a seducable woman. She let herself fall for Herod even though she was married to his brother Philip. an influential woman. She instigated Herod's arrest of John. 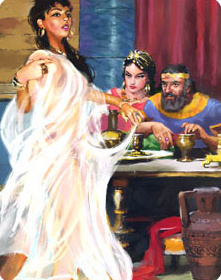 Later her daughter came running to her for advice about what to ask for after Herod promised the girl anything following her dance routine. a bitter, revengeful woman who held against John the fact that he had denounced her illicit union with Herod. an opportunistic woman, who recognized and seized the chance to get back at John. a ruthless woman who demanded John's death by beheading. I would submit tha there may be a little of Herodias in most of us. An attitude that is impervious to sensuous flattery, forgives wrongs, leaves revenge in God's hands, and responds with humility to criticism (deserved or not) does not come naturally to me or most of us. The Herodias in us is someone only God can change. PRAYER: Dear God, please help me to put to death (i.e. crucify - Galatians 2:20) the life of carnal emotion and response that rises naturally within me. Amen.